The cost of college textbooks has risen at 300% the rate of inflation since 1978, with a 90% cost increase over the last decade alone. Students increasingly report not purchasing textbooks due to high costs, a trend which is widely recognized to negatively impact student learning outcomes. To address these concerns, FSU Libraries are offering Alternative Textbook grants to support faculty and instructors in their efforts to replace commercial textbooks with open alternatives that are available at no cost to students. For information on the winners of the first round of grants in March 2017, see this press release. 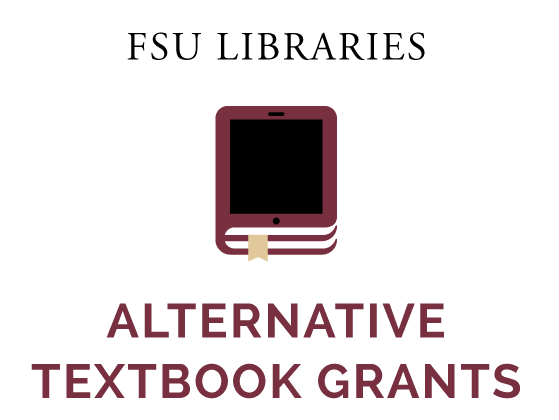 During the 2018-19 academic year, ten grants of $1000 each are available for FSU faculty or instructors who are interested in adopting or remixing open textbooks and educational resources to replace commercial course materials. Proposals to replace commercial materials with Library-licensed electronic books or journal articles will also be considered. No more than one grant will be awarded per instructor. Applicants should review the information below before completing the online application form. Additionally, FSU Libraries is partnering with International Programs and our international study centers to offer ten grants of $1000 for main campus instructors that are teaching at our international study centers (five grants per application period) and six grants of $1000 for instructors based at each of our European study center locations (three grants per application period). Additionally, the Republic of Panama will offer two grants of $1000 for instructors based at FSU Panama. Please see the International Programs OER Grants page and application for information specific to applicants teaching on International Programs. The Libraries' Alt-Textbook team will review completed application forms after the following application deadlines: October 1st, 2018 (for spring and summer on-campus courses) or November 15th, 2018 (for courses taught at our international study centers) and February 1st, 2019 (for summer and fall courses). The Alt-Textbook team will notify successful applicants within two weeks of each application deadline. Project timelines may vary but must be completed within 18 months of the date that each grant is awarded. Obtain a letter of support from your department chair or school/college dean, to confirm that replacing your current textbook will not contravene any applicable policies. Complete the online application form by the deadline. Funds will be distributed for professional travel expenses, technology, or software following procedures outlined in a memorandum of understanding between FSU Libraries and the successful applicants.